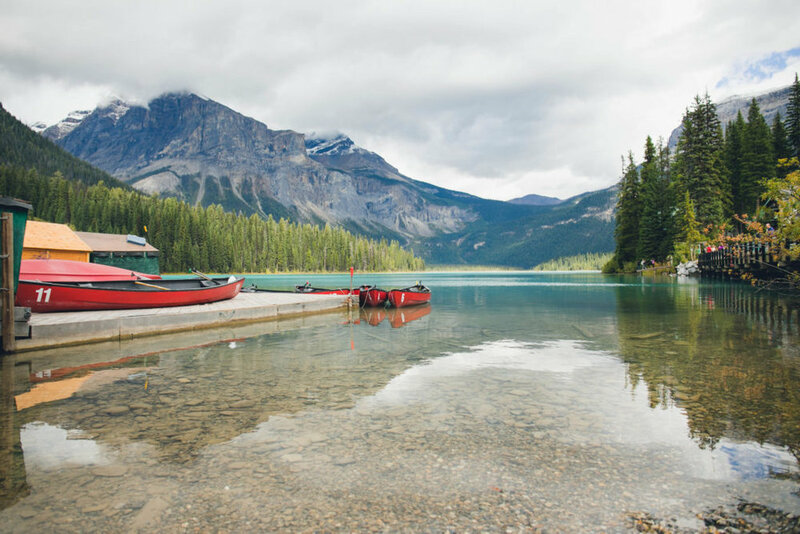 Canoeing in Emerald Lake, a glacier-fed lake in Yoho National Park, was my favorite part of our trip. We arrived at Emerald Lake in the middle/later part of the day. There were people always coming and leaving, so parking wasn’t too difficult. We rented two canoes for four people at $45 each for an hour. All rentals are first come first serve, more information here. This is cheaper than Lake Louise’s rental of $85/hour and $75/half hour! They provide each person with a life vest and paddle, and dry bags can be rented for extra. While there was light rain, the water was calm and emerald, and the mountains and glaciers visible in the background. The tree lined loop trail around the lake is mostly flat with little elevation and has great views. It is about 3.3 mi, so allow 1.5 hours. There is a bridge on the right that leads to a nice dock. I would recommend walking the trail in this direction (counter-clockwise, towards bridge). There are several points in the loop that lead to a range of other more difficult and spectacular trails. We arrived around 4:15PM, it just so happened that tickets were cheaper starting at 4:30PM. So we waited until then to pay $29/adult instead of $49/adult. They are open 8AM-10PM in the summer and 10AM-6PM for most of the rest of the year. Check here for hours/rates before you visit and pre-purchase tickets here. The view at the top was amazing, there was a cool observatory with an informative exhibition. There was also a gift shop and cafe that was being built during our visit. You can walk along the boardwalk to Sanson’s Peak which is an easy and quick walk. While Lake Louise is a stunning lake and the most popular/known in Banff, my favorite was still Emerald Lake. It is quite crowded, and parking is a more hard to find, but still available. Here the canoe rentals are expensive ($85/hour, $75/half hour). A great (and easy) walk to view the lake from different angles is the Lake Louise Shoreline Trail. It is about 2.5 mi roundtrip along the lake and takes about 1 hour. The light reflecting off the surface is harsh all day, so I would recommend coming either in the morning for sunrise or around sunset for photos! We parked near the Bow River Pedestrian Bridge and walked about 0.75 mi to the falls. It was 1.5 mi roundtrip with some elevation. The first part had to trails to choose from: under pine trees or right along the river, until you reach the paved part of the trail nearing the falls. The waterfall itself is wide and short, and may not seem super impressive, but the view of the river-bend, exposing the mountains in the distance is one to see. Other lakes we visited were: Moraine Lake, Johnston Canyon, Two Jacks Lake, Natural Bridge, Peyto Lake, Athabasca Glacier, and Maligne Canyon. All worthwhile spots I would recommend!